DUG Insight User ManualFrequently Asked QuestionsFrequently Asked Questions WorkflowsHow do I create a 3D Chair? Chair cut seismic displays allow for concurrent viewing of multiple inlines, crosslines, and time/depth slices. This display can be created by combining sculpted volumes and can be updated on the fly by modifying process inputs. 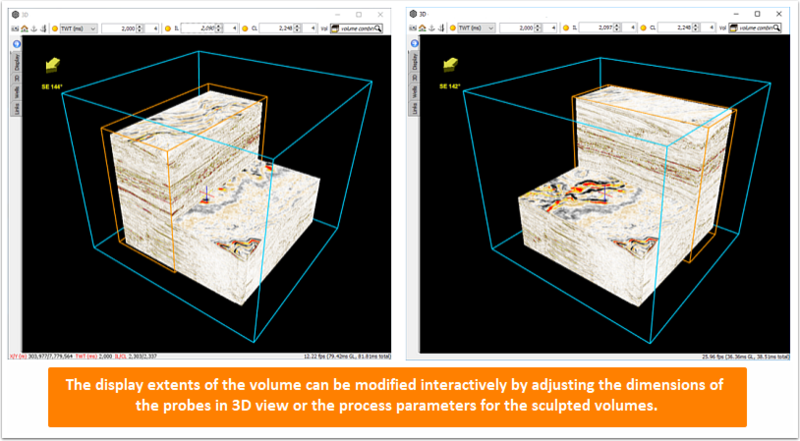 Note: The Explorationist module is required for the Volume Sculpting process and the Volume visualisation feature (see Explorationist module). The first probe will be used to cover the full extent of the volume which will allow the entire 3D 'cube' to be displayed in 3D view. To display the data using the probe, select the probe in the 3D view > 3D tab and check the Use Probe box. Probe 1 - used to set the display extents of the 3D view area. Probe 1 can be as large or a small as you would like. This probe will define the maximum display extents. In 3D view, open the 3D tab, check the Use Probe box, and select Probe 1. Probe 2 - This probe will be used to adjust the horizontal extents of the 'back' of the chair. 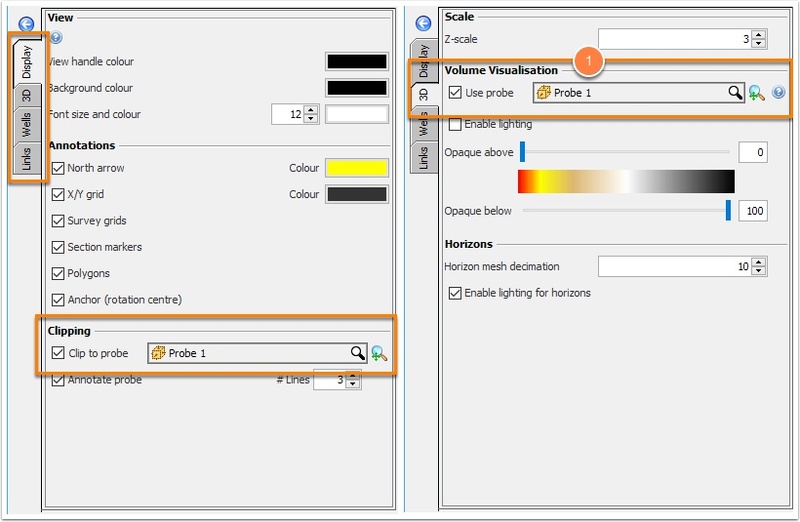 In the 3D tab, make sure the Use Probe box is checked and select Probe 1 (see Volume Visualisation). Select the Volume Combine volume from the volume drop down menu. To define the horizontal extents of the back of the chair, click the pencil icon for Probe 2 and click-drag the probe to adjust the extents. Click the pencil icon again to leave editing mode and the volume extents will update in 3D view. To define the vertical extents, modify the Top Horizon value in the Volume sculpting 1 process. To define the vertical extent of the seat of the chair, open the Volume sculpting 2 process, and enter a value for the top horizon. If you'd like to limit the horizontal extents of the seat, this can be done by modifying the extents of Probe 1. If you'd like to hide the probes, this can be done by disabling the display in the Control Panel > Probe tab. Prev: How to apply complex hand-drawn mutes to gathers and combine 2D results? Next: How to estimate seismic bandwidth using spectral decomposition?